Clara Barton Parkway is closed between the Glen Echo Turnaround and Chain Bridge. The road may remain closed through the Tuesday evening rush hour. Six-foot-long potholes made the road unsafe and required immediate attention. 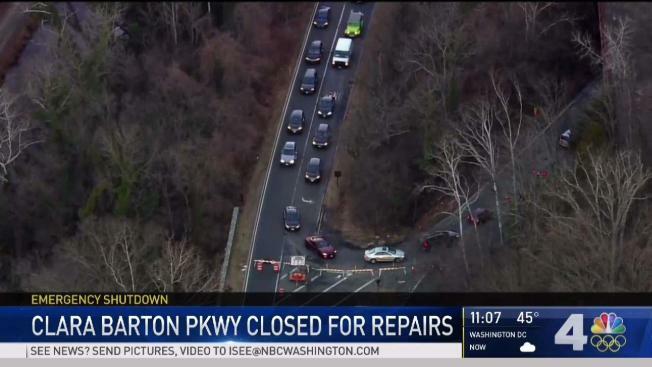 Potholes on Clara Barton Parkway were so severe that the National Park Service shut down a three-mile stretch of the road so drivers would stop swerving across the yellow lines to avoid them. Commuters heading to work Wednesday morning found themselves in a traffic mess. The road that runs along the north bank of the Potomac River is shut down in D.C. and Maryland between Chain Bridge and Glen Echo Parkway. The road was reopened just before 4 p.m. Wednesday. The potholes posed a safety hazard, NPS spokesman Aaron LaRocca said. "In order to avoid these potholes, drivers were actually crossing the yellow lines and entering into head on traffic," he said. The potholes were so big Wednesday morning that News4's Adam Tuss was able to lie down in them. He's 5-foot-10. "We understand this is a crucial part of the region's transportation network," he said. "We're striving to get this work done as quickly as possible." Drivers are advised to seek alternate routes, such as George Washington Parkway or River Road. Stick with News4 for updates. Transportation reporter Adam Tuss has the latest on Twitter.